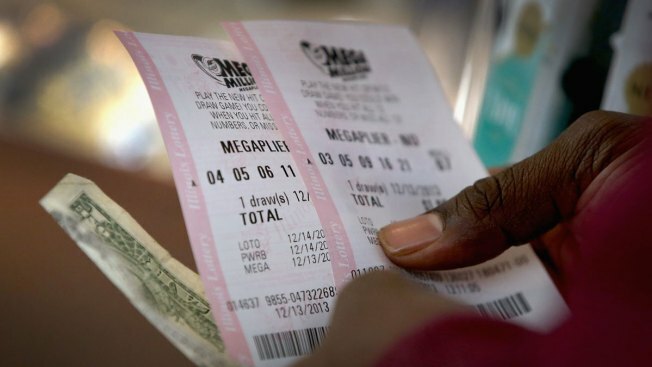 A customer buys Mega Millions lottery tickets at a 7-Eleven store on Dec. 13, 2013 in Chicago, Illinois. A West Town neighborhood gas station sold a $1.85 million winning Lucky Day Lotto ticket for the Tuesday evening drawing. The winner, who has not yet come forward, bought the winning Quick Pick ticket at Grand Shell, 505 N. Ashland Ave., and matched all five numbers ­­– 07 – 23 – 27 – 28 – 38 – in the Tuesday evening drawing, according to the Illinois Lottery. The gas station will receive a $18,500 bonus, 1 percent of the prize amount, for selling the winning ticket.